As you are reading this, I'm back from Perth and am busy with my graduation ceremony which is tomorrow. My parents are here in Down Under with me and we'll have some great fun. If you're wondering about the interview, no I didn't get the field engineer job. Was pretty unhappy actually but I'm happy too. Did I mention Aaron was shortlisted for the same company and he got the job. Rosalind, if you're wondering which company, it's Baker Hughes. I'm still happy for myself since I was one of the 20 candidates screened from hundreds of applications. And I have a handful of other interviews (Santos, Shell, Mars Australia etc.) waiting for me telling me I've been shortlisted and some haven't get back to me yet since the application date is still open. Overall, it's really not that bad. I'm not doomed, I must stay positive but really can't deny the fact that I am still a little unhappy. It was a tough 2 days. Intensive, challenging, draining and rewarding practically sums it all up. I guess we'll be relocating to Perth for good very soon since most of our jobs require us to be based in Perth. I know, I know.....yet another egg post. I told you, I really love my eggs. Gimme salt and pepper, bread and butter and one egg and I can do wonders. This is called coddled egg. I don't have an egg coddler but I've successfully coddled it my way. Coddled egg is basically eggs cooked just below boiling point for a short while so the whites will hold together. The yolk should be slightly thickened and flowy and whites completely set. It is peelable but wobbly. Bring a pot of water to boil making sure it is enough to completely submerge an egg completely. When boiling, gently lower in the egg (or eggs) and set your timer to 3 minutes and 30 seconds for a small egg and 4 minutes in my case for an extra large egg. Once time is up, turn off the heat and lift it out with a tea strainer and run it under the cold water tap. Break the shells gently all over on the table. 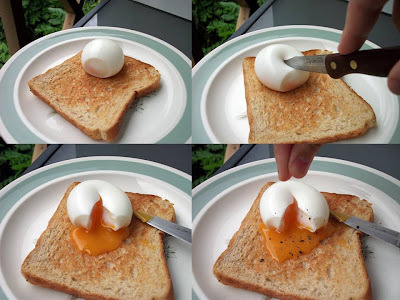 I generally will start breaking my coddled egg from the blunt end of the egg since there is a large air pocket trapped in there. Chances are you will not break it so easily. You know how when you are involved in accident, say you hit the car in front of you. The front of your car is analogous to the air pocket. It hits the car in front and start absorbing all the energy and when it reaches you (you are analogous to the coddled egg in this case), you experience the least impact possible. Sorry...ignore me. No one wants to know the engineering of eggs. Just start tapping it from the blunt end, less fragile basically. When you are done tapping it all over, submerge it in the ice water while you start toasting and buttering your bread. When done, peel the eggs. The shells should come off nicely. Warm it back in the pot of water and wipe it with a kitchen towel. Yes, I always wipe my eggs so they don't turn my bread into soggy squares. Cut in the eggs and let the yolk flow out like magma. Salt and pepper the yolk and smear the yolk evenly on the bread like your usual spread. Briefly cut through the soft whites and smear it around the bread. That's it, serve. You can also use coddled eggs to top off your Caesar Salad and soups. 11 comments on "How to coddle egg"
Hi Quinn, Be happy youve got a lot going for you with all those interviews lined up!! This is dedicated to you incase you have not read thru my lastest two post. Have fun with your parents !!! Hi Quinn, good luck ! Hi Quinn, you're right, stay positive. You'll get the job you want. This egg is so perfect for breakfast, lovely. That's really good news, Quinn! Wishing you both all the best! HBS: Glad you find it helpful. Have fun with it! Thanks Elin. I'm just looking for the right free time to make the oreo doughnuts. Can't wait!!!! Thank you so so much! Thanks Adrienne. We need to catch up. Both our parents are gone! Congrats on your graduation! Don't feel too sad about the interview. I had that experience before. Will be good. It's already good that you get shortlisted. Soon you'll get better and better! Thanks for sharing about the coddled egg. I've eaten such egg in a Korean Ramen restaurant before and was wondering how they did it. Like you, I'm an egg lover! Yeap, I'm still hoping to find a big piece of crab underneath the large pile of noodle! You two are not the first to say that this reminds you all of ramen egg, glad you like it! Have fun and get cracking with the eggs at home! How can anyone resist oozy egg yolk...congrats and good luck!